We are a locally and independently owned brewery in Kewaunee County, Wisconsin. We love brewing great, quality beer, and we hope you'll love drinking it as much as we do! Thumb Knuckle Brewing Company opened March 18, 2017 in Walhain, WI, just west of Luxemburg, by Dain Treml and Ed Thiry. Best friends since 3rd grade, they were always up to something, including learning to homebrew together. Can you imagine how thrilled they are to open and their own brewery in the area they grew up in? The brewery is named “Thumb Knuckle” because of its location on the map. 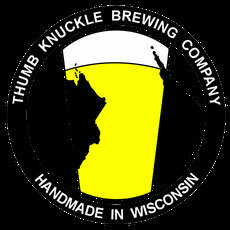 Wisconsin looks like a hand, and the brewery is located on the “knuckle” at the base of the “thumb”. Sticking with this homeland pride, Dain and Ed source nearly all ingredients locally, and their brewing equipment is made from repurposed dairy equipment that was once used on a local dairy farm in the area. This one-of-a-kind equipment makes the brewery very unique. Dain Treml is the Head Brewer. When he isn’t working his day job as a foreman for KS Energy Services, Dain is spending time with family and friends, hunting, and always thinking about what beer recipe is next. Dain started brewing beer as a hobby in the corner of his basement, eventually taking over the entire basement to the brewing process. Over the last decade, Dain has perfected his recipes and moved from a hobbyist to an entrepreneur. Dain’s role as Head Brewer includes managing and inspecting raw materials, managing supplies and equipment, brewing beer, managing the fermentation and lager cellar, planning kegging, performing laboratory management and quality assurance, implementing hygienic systems and processes, carrying out general management of brewery production and employees and maintaining brewing equipment. Ed Thiry is the Brewmaster. By day, Ed is the Operations Manager at the FEECO Tolling Center in Green Bay. While studying mechanical engineering at MSOE, Ed focused on the brewing process as much as possible for projects. It was then that his dream of opening his own brewery began. He moved to Hamburg, Germany to obtain his master’s degree in Renewable Energy Systems, then worked in Lübeck, Germany as a project manager to install wind farms across Europe for 3 years. Wanting to focus on brewing beer and opening the brewery, Ed began his studies to become a Brewmaster in Germany (Diplom Braumeister). He completed an 18-month internship in a little brewery in Bavaria called the Brauereigenossenschaft Taufkirchen. Ed’s experience and knowledge gained contributes to the possibility of implementing world-class beer quality and brewery operation techniques. His role as “Brewmaster” includes the designing, planning, installation and optimization of the brewing facility and operations. His other tasks include public relations, planning expansion, and new recipe development.